"Excitement that can almost TOUCH YOU!!" In the annals of 1950s sci-fi films, It Came From Outer Space is largely considered to be one of the best and, in many ways, the 'first'—in the sense that it set the mold for where '50s sci-fi (good or bad) went. It created a distinct setting and continuous theme, most notably the lone scientist facing a great evil that no one else believes. It also ushered in a whole phase of 'paranoia' films in which aliens were a vague threat presented in mysterious terms, often an allegory for Communism in later films. Of course, virtually any sci-fi or horror film from the that era has a huge uphill battle to fight nowadays, since most of these classics are immediately condemned simply by virtue of their dated values and often embarrassing special effects (by today's standards). I agree, the charm of some of these older films is their common ineptitude, however many of them are vastly superior to even modern day projects in similar veins and show a wonderful, starry-eyed attitude towards exploring the mysteries of the universe. This is one such example of a film that defined a formula, and completely makes it its own. Based on a story by author Ray Bradbury (who's contribution was portrayed in a greatly minimized way), the film is set in a small Arizona town (actually filmed in areas of California that look just like Arizona, New Mexico, and other areas of the Southwest) where an astronomer named John Putnam lives. One evening, while entertaining his girlfriend Ellen, both of them witness the violent crash of a meteor nearby. Upon investigation, John swears he sees a spacecraft and a strange alien within the crater, but a collapse inside buries whatever was down there. The next day, the whole town is buzzing about the meteor, as well as John's badly interpreted theories as to what it was. No one is interested in what was buried in the crater, and even the local Sheriff thinks John is stirring up too much trouble for the 'simple' folk of the region. Eventually, John suspects that something from the crater is wandering the Arizona desert, lurking in the shadows and planning something evil. When two local men start acting weird, he suspects the alien. Eventually, John believes that some mysterious force or creature is manipulating the town to its own purposes. He comes into contact with these mysterious aliens, but they hide their true goals from him. Unlike similar premises used in later sci-fi, here we see a realization of just how far this concept can go before it gets goofy. In fact, there's very little 'alien' element to the film; just creepy and unsettling portrayals of "townspeople clones" hiding their purpose from prying eyes. The audience is meant to feel John's isolation; first as a loner living in the desert, then as possibly the only sane person left in town. This is done quite well, and effectively thanks to actor Richard Carlson, who basically made these 'lone scientist' roles his forté (moving on to The Creature From the Black Lagoon next). The style is eerie, and only lets loose with special effects (which are very impressive for the time) when it's needed in the story, not just as an excuse to show off rubber suits. Ultimately, the plausibility of such a concept is what also makes It Came From Outer Space an impressive storytelling example. As I touched on earlier, the style of this film has been imitated so often that it's hard not to criticize it or lament its shortcomings. When you dial your thoughts back, however, and remember that this was radical for its day, it becomes more obvious why some of the more subtle details were—and still are—so effective. The story is fairly intelligent and doesn't succumb to a "kill the outsiders" syndrome, but rather uses other approaches. It isn't perfect, but it captures the mood and atmosphere of 1950s fantasy quite well; you can practically feel the yellowed pages of a pulp novel being turned as the scenes roll by. 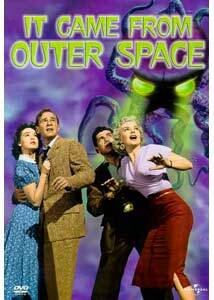 Image Transfer Review: On DVD, It Came From Outer Space is impressive and, I'll wager a guess, significantly remastered. Unlike previous incarnations, much of the terrible source damage is gone, especially the stuff that effected the quality of the special effects. The fine grain details are brought out well and, despite occasional age problems and thick grain, the print is very clean and much better defined than any other version I've seen. I'm impressed. Audio Transfer Review: In an unexpected move, the disc contains a newly engineered Dolby 3.0 discreet soundtrack. It works very well, providing not only new stereo directionality to a previously mono track, but also souping up the musical score (and its characteristic Theremin usage) into a very loud, room-filling experience. A discreet center channel also provides enhanced dialogue and sound effects for the most part. This is actually a surprisingly good audio track, and I'd certainly like to see future releases take this approach to livening up mono sound. Extras Review: Right off the bat, the most disappointing aspect of this disc is the lack of an option to view the film in old-fashioned "red/blue" 3-D. It Came From Outer Space was the first major commercial film to be release in 3-D, and it seems to be an important part of its history. About 3 years ago, I had the privilege of actually seeing a theatrical version of the movie in its original 3-D format and I'll admit, the effect adds little to the film. Still, it would have been a nice addition. A 30-minute documentary entitled "The Universe According to Universal" provides an excellent view at not only Universal Studios' commitment to sci-fi in the 1950s, but also looks closely at the production of It Came... I'm going to assume that this documentary will pop up on later DVDs from Universal, focusing on their respective films, as this feels like it's been cut into many pieces. In any case, the personalities presented (most of whom were fans who later elevated their hobby to become historians, sort of like Forest J. Ackerman) offer lots of tidbits and even leftover props to the mix. This is well worth watching for a dose of B-movie history. A superb feature-length commentary by Tom Weaver (who's done some other impressive commentaries for older sci-fi) provides even more excellent information on all sorts of elements of the production. He seems to be reading from notes, but manages to pack in massive amounts of information. If you enjoy the film, this is a must play; it's an amazingly adept commentary with humor, trivia, and everything you'd need to know. A gallery of stills and promotional art is presented, accompanied by some of the film score (more Theremins). In addition, there are trailers and some production notes. A few bios and filmographies accompany all this. The disc's presentation is muted (no fancy animation or menus), and the artwork is entirely new, not at all based on the original posters. I think this was probably a bad idea, but it seems to be the trend in DVD re-releases. It should be noted that the squid-like alien on the new cover looks nothing like the "xenomorph" in the movie and has nothing to do with the film. A piece from an era when cinema wasn't quite as cynical and sci-fi was a sacred institution of exploring the unknown, It Came From Outer Space withstands the test of time. It isn't particularly brilliant or masterful, but it is effective and shows that these films can still teach lessons in this modern era on how to make these stories effectively without relying on effects and violence. An extraordinarily poor made-for-TV sequel was released in 1996, and tried to outdo precisely everything I'm talking about. Its faded into obscurity, but this original will not.